I can’t believe that we are in our last week of living on Erraid. We only have a few more days left before we shall be packing up our stuff and moving on. And today the sun is shining, it’s beautiful and another wave of visitors just left – friends old and new who came to share the island with us and experience the wonder and magic. When I look back at this time I know all of us will be filled with many memories; of wet and windy walks, getting stuck in bogs, not having fresh water, crying at the raw beauty, planting and growing a garden, arranging the flowers, music and singing, meditating, chatting, making candles, making bread, yoghurt and endless creative meals. Watching the slug crawl out of the plughole. Finding tadpoles in the peat water bath. Getting angry at the way things break down, laughing with the children, amazed at the delight of a sunrise or sunset. Paddling across the sound. The calmac ferries and journeys on and off island. The morning boat rides when the children wanted the homeschooling to end and to attend the primary school in Bunessan. I will also remain forever touched by each one of the thousand smiles I think I must have witnessed when greeting the faces of everyone we met both living here and those who came to share community life with us for a week or two. Also honouring the coming and going. Grieving the loss of Goosie. Saying goodbye to community members who left the island while we were here and saying hello to potential new ones who arrived. Richness, stories, beauty and gratitude…Yes, gratitude is the attitude. A useful and memorable mantra that helped again and again when Erraid would throw a challenge my way and I was invited to engage with finding a solution in peace rather than by arguing with reality! Great thanks for The Work of Byron Katie. Erraid (especially in Winter!) has the potential to generate stressful thoughts by the minute… thankfully hardly any of them were believed ! Huge thanks to my children and husband for coming on this year adventure with me, for saying yes when I planted the seed of the idea that we uprooted from our lovely warm, light and new eco-home to come and live in the tiny and drafty Pier Cottage with it’s three rooms, bathroom an old smoky rayburn. I have loved Pier Cottage as much as any home I’ve ever lived in. Huge thanks to The Erraid Family for your welcome, your helping us find our feet, our place and being so willing to have us stay for the year. Huge thanks to all the family and friends who made the (quite extensive) trip out to see us: Mum and Dad, Will and Angie, Michael Sharpe, Bettina and Isabella, Frank and Margaret, Mie, Martin and Towa, Kate, Stephen and the girls, Jane, Susie, Rosa and the boys, (hope I’ve not forgotten anyone)who came specifically to see us. Also I thank all the other visitors who came to the island. Everyone makes such a wonderful contribution. And so we move on. Summer Holidays, trips away and then as life would have it, back to our lovely home in Findhorn. Will we return to Erraid? God-willing, the answer is yes. 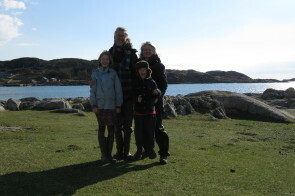 It takes a lot of courage to be responsible for / with children on Erraid and…. You Did It!!! Well done. Would have loved to have seen you there. I am making my way there in my mind…. slowly, though. Much love to you all and enjoy the Summer and a Happy Return to the Bosom of The Park!